When I was packing for the move from Chicago to Cambridge, I figured the transition would be easy for two reasons, both of which are related. First, the two cities share a temperate climate. I grew up in Wisconsin and love—absolutely love—the changing seasons. For example, I’m not merely unfazed by below zero weather, I revel in it. The second reason is partially a consequence of the first—the Midwest and New England share a similar flora. Deciduous forests were the playground of my youth, where I went to escape the heat of the summer or romp through the snowy winter. Having been a Cantabrigian for just just over two months, I can’t speak to the winters yet. But I can say something about the plants. A jaunt to Middlesex Fells over the Labor Day weekend affirmed my fondness for temperate deciduous forests. Still, I wasn’t quite at home. The Fells has a marvelous mix of deciduous oaks and evergreen pines perched on rolling hills and rocky outcrops. The whole landscape is reminiscent of the Calvin and Hobbes cartoons I devoured as a kid, but there was something missing. That something is my history with the place, or lack thereof. Research confirms it. I wasn’t a part of the study in question—it took place almost a decade ago—but its findings confirm why I am both predisposed to liking New England’s woods and why they aren’t quite home yet. The study’s authors surveyed 328 park users in Ann Arbor, Michigan, to see whether they were attached to a particular park or just a particular setting. The study’s authors classified participants as park neighbors, visitors, volunteers, or staff, reasoning that these backgrounds would tint the lenses through which people viewed the parks. The researchers found that neighbors who frequented a particular park were smitten by that place in particular. Perhaps the bond was formed during solitary reflective walks, or maybe weekend picnics with the family. Regardless, they liked those place in particular and didn’t find substitutes as appealing. Park volunteers and staff, however, were more inclined to treasure a park’s ecological contributions rather than sentimental ones. When shown photographs of a particular ecosystem, say a prairie, volunteers and staff were more likely to rate those shots highly regardless of their location. Volunteers and staff, who the researchers reasoned to be more ecologically knowledgeable, were also more open to restoration projects that supplanted invasive species with natives. Park neighbors and visitors tended to be happy with the landscape the way it was and generally opposed changes. The differing perspectives of sentimental park users and ecologically principled individuals may help explain my hesitant fondness for the Massachusetts wilderness. The study seems to confirm that I straddle the line between two types of people. I have a feeling that many people are like me, especially those who recently moved. Our sentimental side aches for a favorite tree or preferred vista, but the rational ecologist in us appreciates native plant assemblages and landscapes. People develop not just an affinity for nature, but the nature outside their window. That suggests not only that we should get outside, but also bring the outdoors closer to home, whether that be in the form of a city park or wild backyard. First-hand experiences with nature can be powerful ways to inspire people to adopt their own environmental ethic. I’m not the first to posit this theory—David Gessner does just that in his book My Green Manifesto, which I’m currently reading, as have others before him. Indeed, I can trace part of my own environmental ethic to a childhood spent in the park down the street or at the seven acres of scrubby, overgrazed woods just outside of town that my dad was rehabilitating. They are the type of landscapes I love and am fighting to preserve. Indeed, part of the reason I’m fascinated with higher density living is the potential it has to keep the wild places wild, the semi-wild places semi-wild. 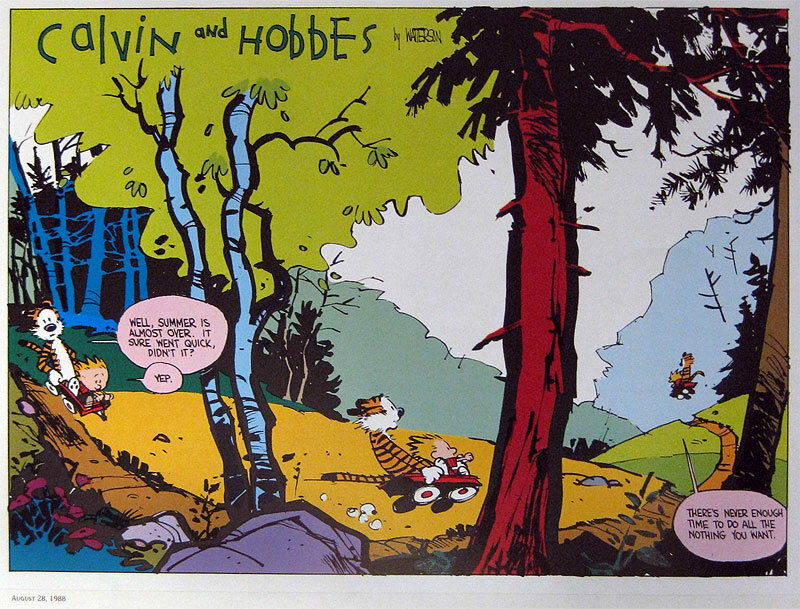 Calvin and Hobbes’s zany woodland adventures captured my childhood imagination because I saw in them a bit of my own al fresco self. I want future generations to have that chance, too.